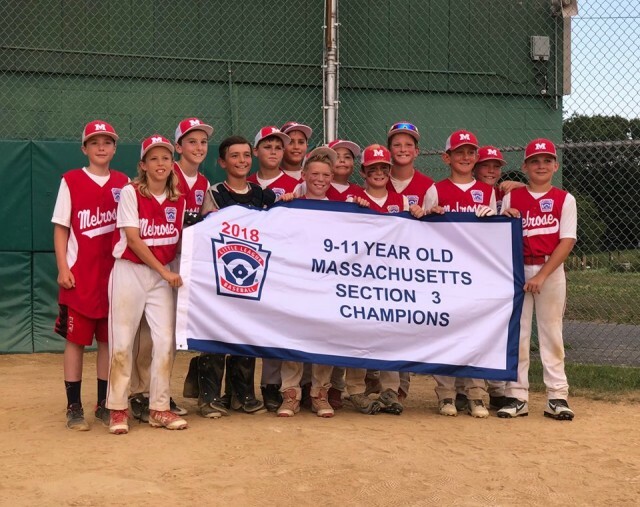 Melrose Little League's 11 Year Old All-Stars are off to STATES! Mass Section 3 Title Clinched! Updated Monday July 16, 2018 by Cory Thomas. Melrose Little League, our 11 Year Old All-Stars are off to the State Championships in Braintree! Melrose, 2018 Section 3 Champs, will take on the Section 4 Champions on Saturday, July 21st at 4 p.m. at Roy Googins Field in Braintree. The 11 year old tournament began over two weeks ago with 200+ teams across Massachusetts. The Melrose 11's are now part of the Mass State Final Four! Congratulations to the players, parents and coaches! Thank you all for your continued support and well wishes. Hopefully a large crowd from Melrose can make the trip down to Braintree to root on these hard working, talented group of baseball players!